Looking to ship your cargo from the USA? Need a Shipping Overseas Rate? Worried about the safety and handling of cargo for international shipping? Would you like to have some advice on how to go about the shipping process? Here at the USG shipping Line, we will help you with this step by step process. Shipping a full container load is one of the options in the Ocean Freight industry. They made by weathering steel and they are coming in different size and type. The containers get loaded, unloaded and transported on the wheel or flatbed. Depending on the type of cargo, containers are the most economical way to ship the cargo all over the world. The Full Container Load (FCL) is an Ocean shipping method where the container get loaded for one shipper and one consignee. Volume-wise, Full container load is the cheapest way to ship the cargo. US General Shipping offers full container load service from any place in USA or Canada to all the major cities and Ports in the World. You can have mixed commodities in a Full container load as long as there is not a mixture of the hazardous items in the same load. - What size of container do I need? - Can I manage the loading of the ocean freight container if the empty being provided to me? Many customers believe that they can transport their goods to the nearest port for loading them into the container, but such an option does not exist because the port authorities will not allow you to go inside of the port and load the container. - Where do I like to have my container loaded? It is important to understand that is always cheaper to arrange each step locally. That means if you only use our service from your door to the port of destination and then arrange your destination part locally you will be saving some charges. Our international shipping containers rates also depend on the number of containers. Consolidation rate: Our consolidation rates are always calculated by the cubic feet. That means you will only pay for the space that you are taking and not for the full container, however it is highly recommended to use the 20 footer container if the volume of your shipment is more than 400 cubic feet. Like the full container, you will be saving charges if you manage yourself any of these steps. 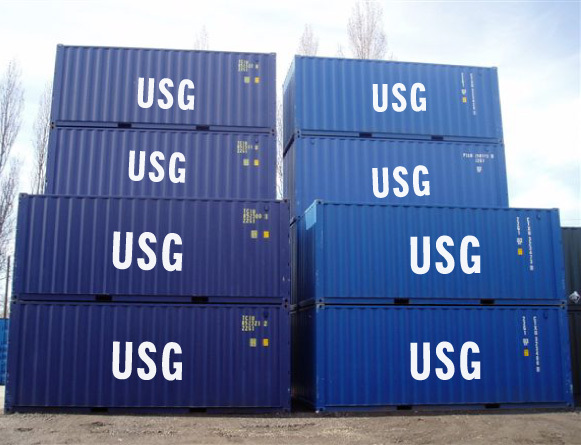 Here at USG Shipping Line, we offer seaworthy certified container in Los Angeles, Miami, Newark NJ, Houston, and Dallas TX and all the other major cities in the United States. Please contact us for our price list and we will give you the details according to your place. High & Heavy, Break Bulk, & Project Cargo: US General Shipping provides specialized service for oversize cargo such as break bulk, heavy machinery, and large industrial grade equipment. We understand that moving incredibly large equipment requires multiple carefully planned, interdependent logistics steps. For many, this is a challenge to make sure all things go right when you're under deadlines and time constraints. We at USG Shipping have been handling many complicated projects since our start; so, we have developed a wide array of logistics networks consisting of transporters, 3PL, carriers, and suppliers. Our unique network allows us to handle high and heavy cargo from any origin for export. Whether you have a large industrial scale crane, Caterpillar machinery, or a bulldozer, USG Shipping can get the cargo moved in a convenient and time efficient way. We offer three to four different options for moving high and heavy items. Some cargo getting moved via open top container or flat racks. Some cargo requires dismantling and containerization while others getting moved as roll on and roll off cargo. Regardless of the challenges associated with moving large equipment and cargo, you can rest assured our team of professionals will do an excellent job on your shipment! Call for a quote today.